........................Published on the front page of THE GRAPHIC July 12, 1897. Source: The British Library. In May 1879 about seventy miles east of Kabul an Irish photographer by the name of John Burke was producing some of the first photographs ever taken in Afghanistan. Burke had been travelling with the British army since 1878, initially advancing towards Kabul from present‐day Pakistan in a military engagement that would be known as the Second Anglo‐ Afghan War (there had already been a ‘First’ between 1839 and 1842 and there would in due course be a ‘Third’ in 1919). The sketch above which appeared on the front page of a British publication The Graphic shows Burke posing Yakub Khan, the then ruler of Afghanistan for a portrait; in the bottom sketch Burke is explaining the development process to the monarch. The photographic process Burke used, the wet collodion process, is by today's standards highly laborious, as it involved coating a glass‐plate with chemicals; it was also very expensive meaning every plate must have been precious to Burke who had to sell his work. The great advantage of the process, however, was its reproducibility as it was the first popular photographic process to create a negative image on a transparent medium which could then be reproduced. Here’s a short video from the Getty Museum explaining the process step‐by‐step. Below is one of the photographs Burke took that day alongside an engraved print of the photograph that appeared in The Graphic. The engravings that appeared in publications at the time were based on both photographs and hand‐drawn sketches; and also on sketches of photographs. The conflict Burke was reporting on was part of the 'Great Game' ‐ a deadly vying of interests between the world's most powerful empires, Britain and Russia. The British invaded Afghanistan essentially to stop the Russians getting a military foothold in the region from where they might threaten the jewel of Britain's empire, India, with invasion – and the story was highly newsworthy. A number of Burke's photographs from the military campaign appeared in publications at the time as well as being sold in photo‐catalogues after the war. Some of them can be viewed at the British Library's online catalogue here. And here’s an interesting short film by the photographer Simon Norfolk which gives a sense of the environment Burke worked in. Norfolk traveled to Afghanistan in 2010 trailing John Burke’s photographic route from the Second Anglo‐Afghan War in the context of the present war in Afghanistan. However, Burke was not alone in his photographic endeavours in Afghanistan. Among others taking photographs during the military campaign were the Bengal Sapper and Miners, an engineering corps attached to the Peshawar Valley Field Force, the same military unit Burke travelled with. Here are some of the panoramic photos they took. While Benjamin Simpson, a doctor based in southern Afghanistan with the British Army during the Second Anglo‐Afghan War and an amateur photographer took a series of photographs around Kandahar. 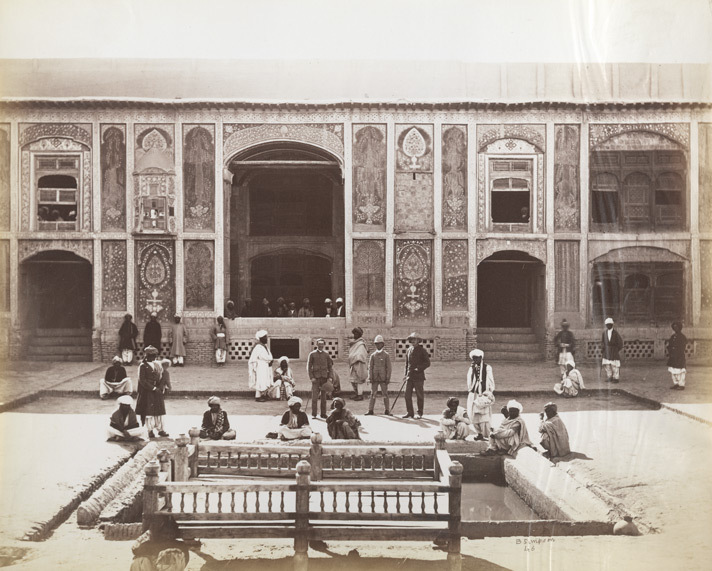 This photograph showing a royal residence in Kandahar was taken around 1881. After the war Charles Ludlorf Griebach, who was employed by the Geological Survey of India, travelled to Afghanistan where he photographed archeological sites. 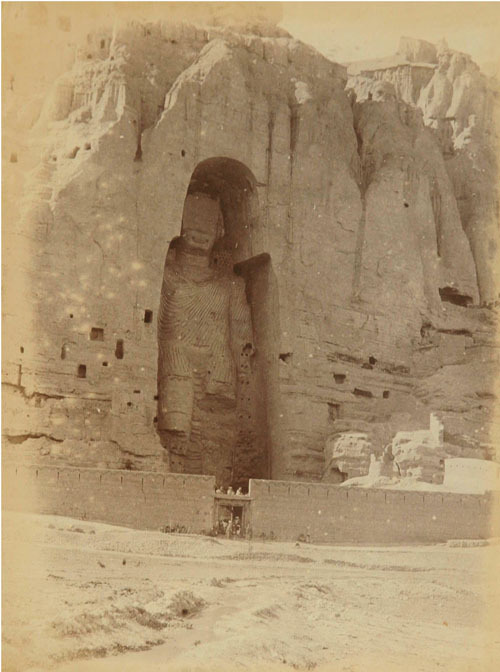 This photo of a statue of the Buddha in Bamiyan in the centre of Afghanistan was taken between 1884 and 1886. 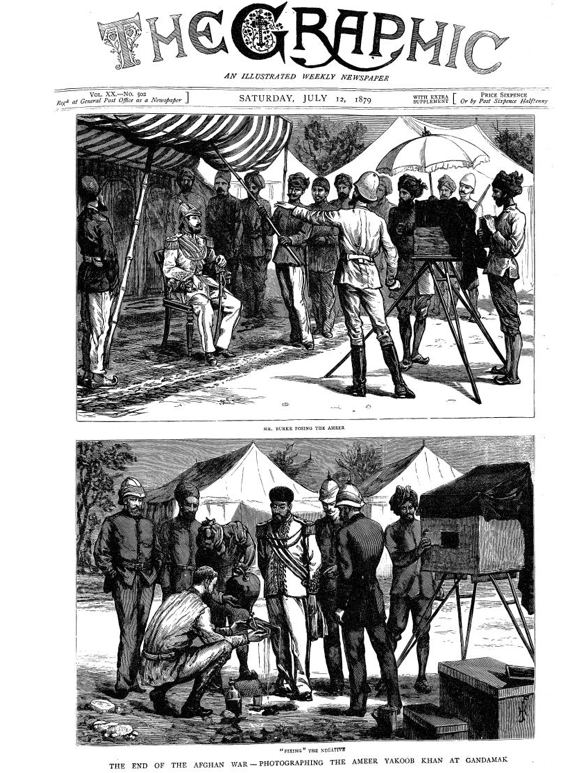 The photographic process in Afghanistan, at least pre‐1880, was very much in the hands of non‐Afghans; but after 1880, according to Omar Khan in his book From Kashmir to Kabul, Afghan noblemen could be found with cameras. This was because of the development of dry‐ plate photography ‐ basically what we refer to as film ‐ by George Eastman of Kodak fame, making photography cheaper and less technically demanding, and as a result far more widespread. It would, in fact, eventually become a hobby of the Afghan royal family. The first Afghan ruler known to be photographed was Amir Sher Ali. The photograph below was taken in 1869 by John Burke at the Ambala Durbar (a grand ceremonial meeting) in British India where the Amir was negotiating a treaty with the British. When Sher Ali died in 1879, his son Habibullah succeeded him. Habibullah was something of a moderniser (albeit a conservatively‐paced one) and a keen photographer who set up his own photo studio in the royal palace – the first of its kind in Afghanistan. He also organised photo exhibitions in the royal gardens where sales from his prints were donated to an orphanage he founded in 1911; and he organised photographic competitions that were advertised in a newspaper called Siraj Al‐Akhbar. This is a picture of him in the newspaper in 1912. 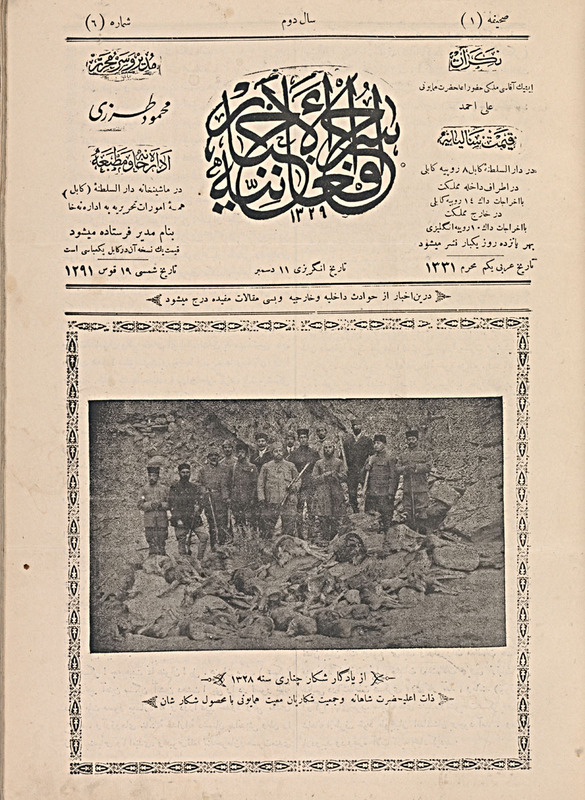 Siraj Al‐Akhbar meaning “Torch of the News” was established in 1911 by the Afghan intellectual Mahmud Beg Tarzi who would later become the Afghan foreign minister. It was, in an agenda‐pushing sense, a ‘progressive’ newspaper devoting much space to articles on science and technology. By its second year of operation it began to be printed on a more advance press. As a result photographs intended for an Afghan audience appeared in print in Afghanistan for the first time, and in a relatively high volume. Though the newspaper wasn’t a publication for the masses – who couldn’t read; it’s biggest audience were the government employees whose wages were compulsorily docked for the publication on a monthly basis. Here are some of the photos that appeared in the newspaper. 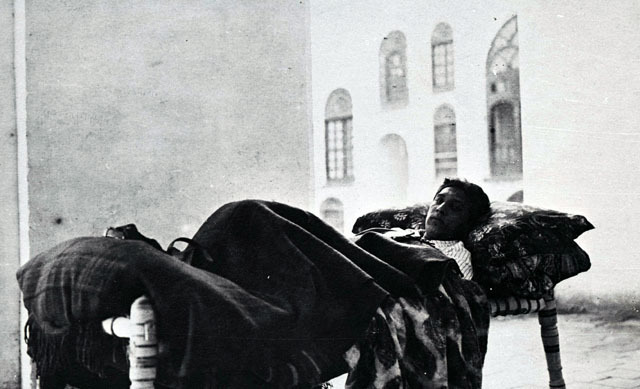 In February 1919 Amir Habibullah was assassinated. His son Amanullah succeeded him. In a bid to strengthen himself politically Amanullah then instigated the Third Anglo‐Afghan War by invading Afghan’s eastern neighbor, British India. The Afghans felt much resentment towards the British at the time for controlling their foreign policy – one of the repercussions of the Second Anglo‐Afghan War. 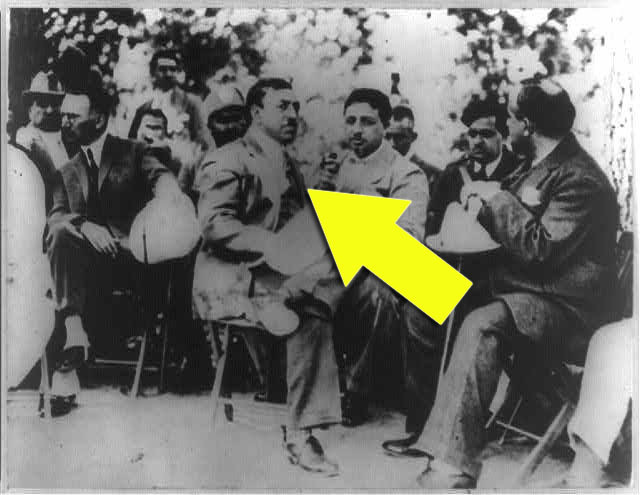 Here’s a photograph taken at the announcement of the war; Amanullah has his back to the camera. 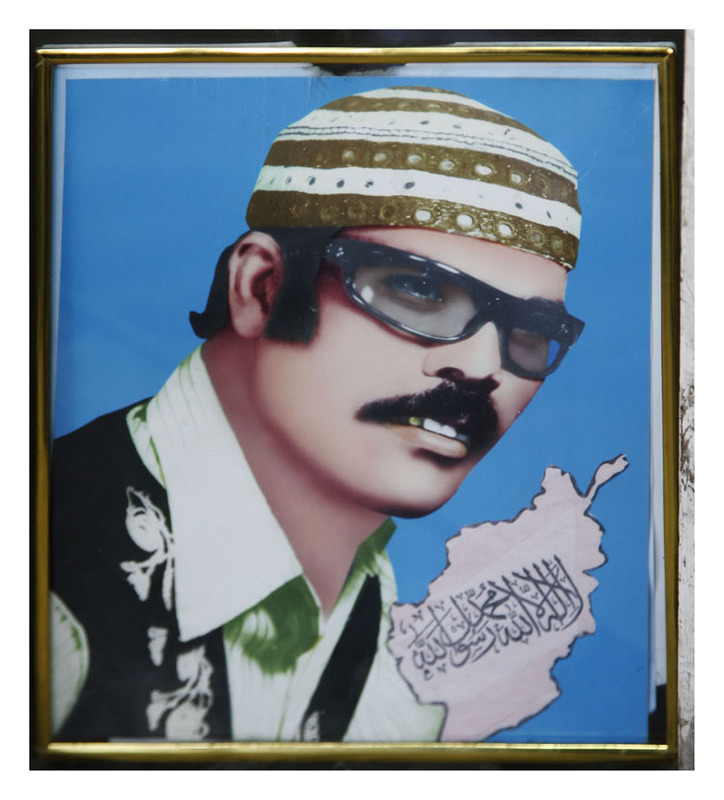 This is what Amanullah looks like from the front – or at least an artist's rendition of him we came across in a digital photo‐studio in Kabul. The war resulted in two likely firsts for Afghanistan, both courtesy of the British Royal Air Force. These were: a revolutionary new perspective of the country in the form of the photographic aerial shot. And aerial bombardment. A few weeks after the war started the RAF bombed Jalalabad. 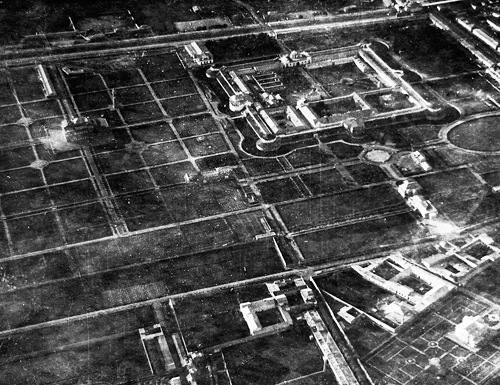 A few days later they bombed the royal palace in Kabul; the picture below was taken by RAF personal during the raid over the city. Shortly after the bombing a cease-fire came into effect, the war ended, and Afghanistan gained control over its foreign affairs from Britain. Meanwhile the Afghan royal household was producing its own photographs on the ground. 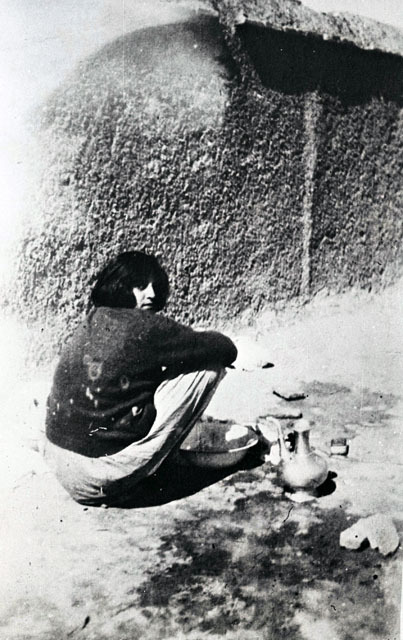 The Amir’s older brother Enyatullah was an avid photographer; he as well as other members of the royal household captured unique, sometimes intimate portraits of life within the Afghan royal circle, like the photographs below of Enyatullah's sick son, Khalilullah, and Amanullah’s daughter Amina washing socks. 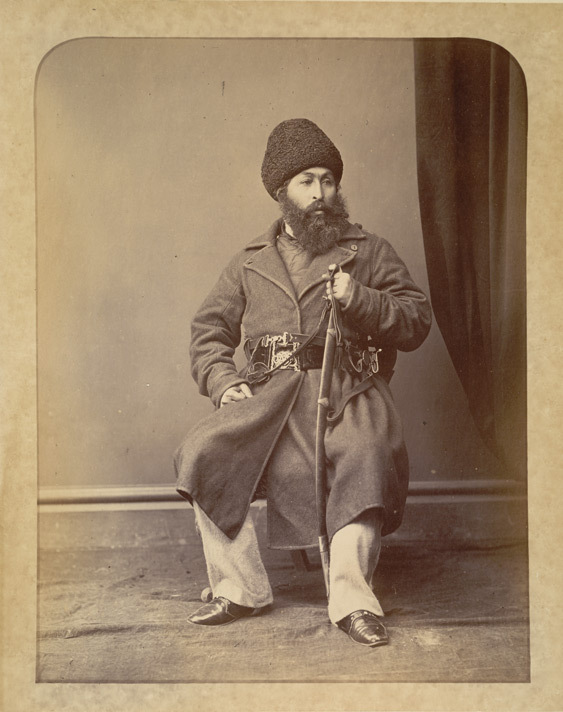 Surviving photographs from the royal collection are archived by the Williams Afghan Media Project run by anthropologist David B. Edwards in the USA. And here's a fascinating video clip on photography in Afghanistan circa. 1910. Amir Amanullah strived for ‐ but didn’t rule ‐ a modernised and technologically developed country along European lines; in a bid to reach such a state he introduced a series of dramatic social reforms that attacked the conservative core of Afghanistan. This would eventually lead to his downfall in 1929. But before that happened he and his queen ‐ Soraya, the daughter of Mahmud Beg Tarzi ‐ went on an extensive tour to Europe in 1928. Here’s a picture of the royal couple while in Europe. One of their stops was to the short‐lived Weimar Republic. Such an impression did they make, their visit inspired the lyrics of a popular and rather bizarre German song from 1930 by Paul O'Montis who sings of Amir Amanullah as more of a catch, romantically speaking, than Charlie Chaplin. 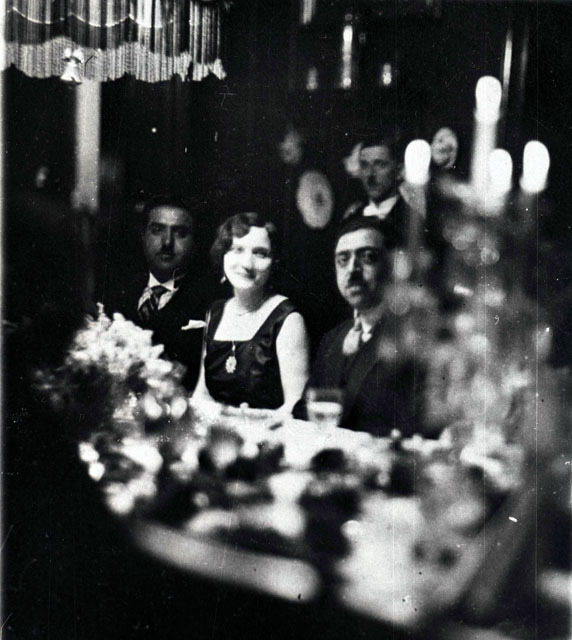 Amanullah and Soraya received a rapturous welcome in Europe and left the continent laden with expensive gifts including a Junker airplane from the Germans and a Fiat armoured car from Mussolini; from the Zeiss‐Ikon factory in Dresden, the Amir ordered some photographic equipment. But who was he buying the cameras for – his brother perhaps? If so it’s probable Enyatullah never got to enjoy the gift. 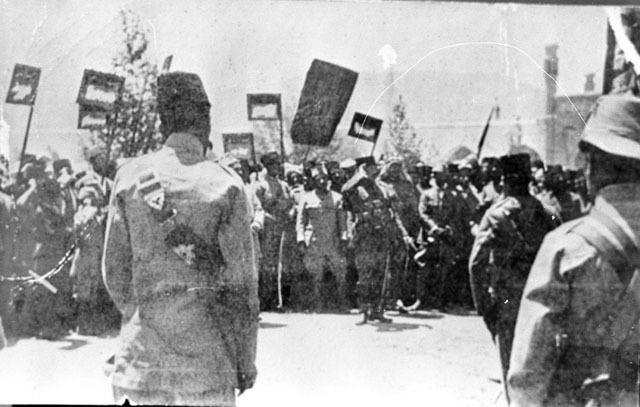 When Amanullah returned from Europe in July 1928, he faced a rebellion. He had been a reformist king trying to modernise Afghanistan at a startling pace – but the tribes revolted and the monarch was overthrown. 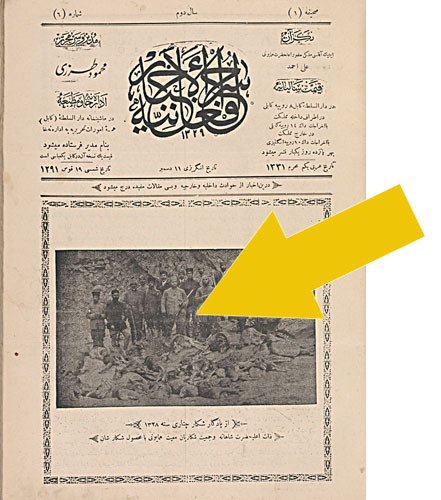 The title of the photo underneath, showing Amanullah (centre) and company in western attire and which may have appeared in the press of time, sums up his predicament: Western Ideas Imported by Afghan King cause Revolt. Amanullah and his family was forced to flee Afghanistan at the end of 1929. After leaving his homeland the ousted monarch lived a life in exile in Europe and eventually passed away in Switzerland in 1960. 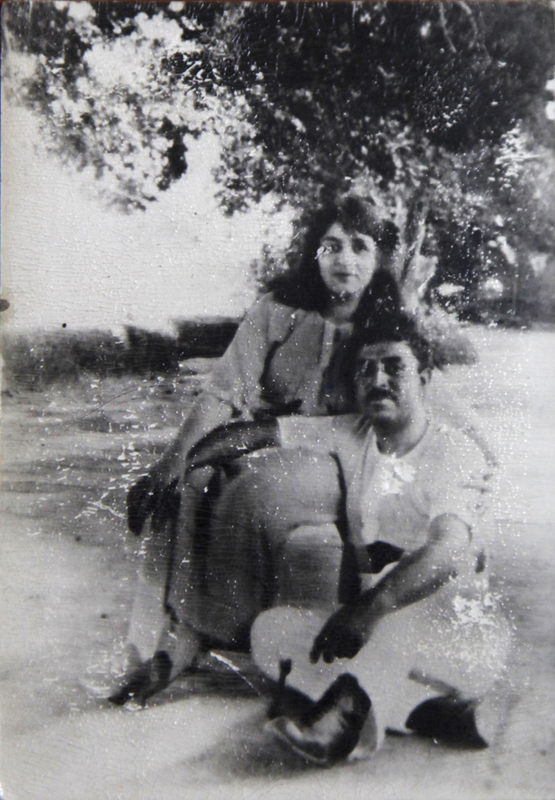 Many photographs of Amanullah and his wife Soraya survive to this day. Some of the pictures like the one below show them in affectionate poses, which contrast sharply with conservative attitudes as regards public displays between Afghan men and women. The story of Afghan photography in the early part of the twentieth century is not exclusively a royal one however (although it is a privileged one). In the 1910s while royal photographers were working in the photo studio inside the palace in Kabul, at least one commercial photo studio operated in the city itself. According to scholars Nancy Dupree, as well as May Schinasi, the photographers who worked in these studios – the royal and commercial ‐ were Afghan, but also Indian. A provisonal 'photographers tree' including the early Afghan photographers can be found here. Photography in India had flourished since it was first introduced to the country, almost as soon as it gained popularity in Europe in the 1840s. In the town of Peshawar on the border with Afghanistan in the then north‐western frontier of British India, commercial photographers such as R.B. Holmes, Mela Ram & Sons, and K.C. Mehra & Sons pursued successful careers in the early part of the twentieth century; and they profited from the military campaigns they photographed on both sides of the Afghan border. 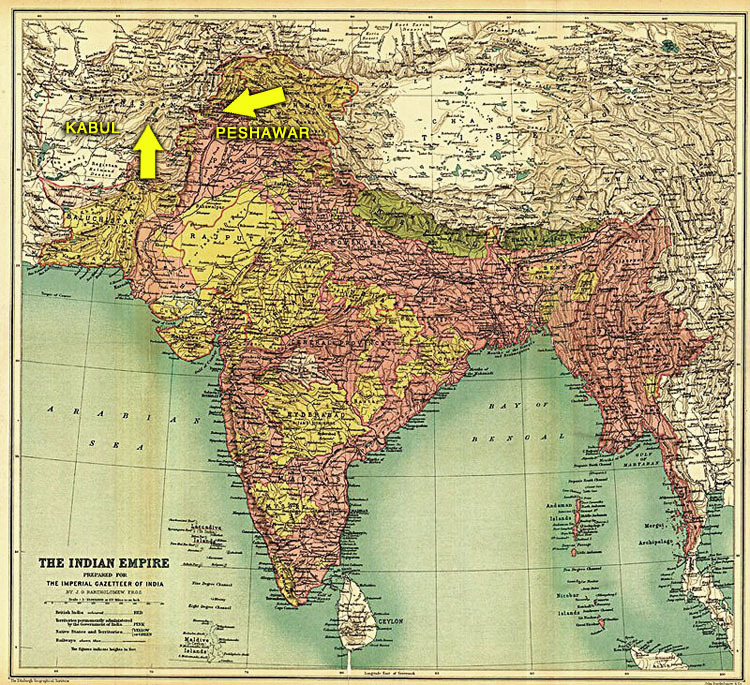 Here’s a map of British India from 1909. And below are two photo‐postcards produced by the Peshawar‐based Prakesh Mehra showing Habibullah Kalikani, the so‐called ‘Bandit King’ of Afghanistan who overthrew Amir Amanullah in 1929. They are both postmarked July 1930, just over half a year after Habibullah was himself overthrown and executed, leaving the way open for Muhammad Nadir Shah to become the next ruler of Afghanistan. Muhammad Nadir Shah lasted four years as leader of Afghanistan until he was assassinated in 1933. His son, Muhammad Zahir Shah, who succeeded him, would rule for four decades. During his reign Afghanistan opened up more to the rest of the world that it had ever done previously. Amongst other developments, that meant movies. 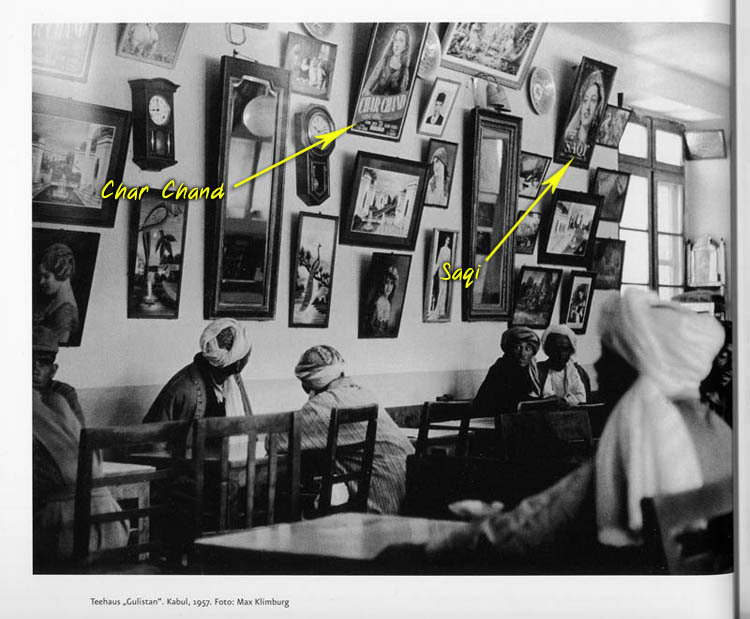 In 1957 the Austrian scholar and long‐time visitor to Afghanistan Max Klimburg took the photograph below in the Kabuli teahouse ‘Gulistan’ (meaning ‘land of flowers’). Amongst the many clocks, portraits of ladies, the odd gentleman, a mirror and a peacock, are two posters advertising the then popular Indian films Char Chand and Saqi. Indian films began to make an impact in Afghanistan in the late 1950s, and, as they do today, they completely dominated what market there was. Here’s a clip from the film Saqi made in 1952. The films wove themselves into the imaginations of the Afghans who went to see them and it's not surprising that there was a demand for photo‐montages like the mock-up we have made below, which were produced cheaply on wooden box cameras, the kamra-e-faoree. The box camera was used primarily for identification photographs but sometimes friends and relatives would pose together and have a photograph taken in postcard format; and it was cheap technology making it all the more available to the general populace. 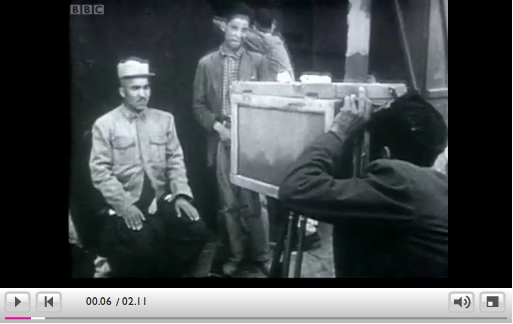 The image below of a man having his photograph taken with a box camera in Kabul is from a 1961 BBC documentary– a short clip from the film can be seen on Adam Curtis’ s BBC blog here. ...............................Source: Adam Curtis Blog, BBC. Photography was slowly loosening its elite associations; cameras like the Afghan box camera as well as mass-produced technology was making it cheaper and more available. 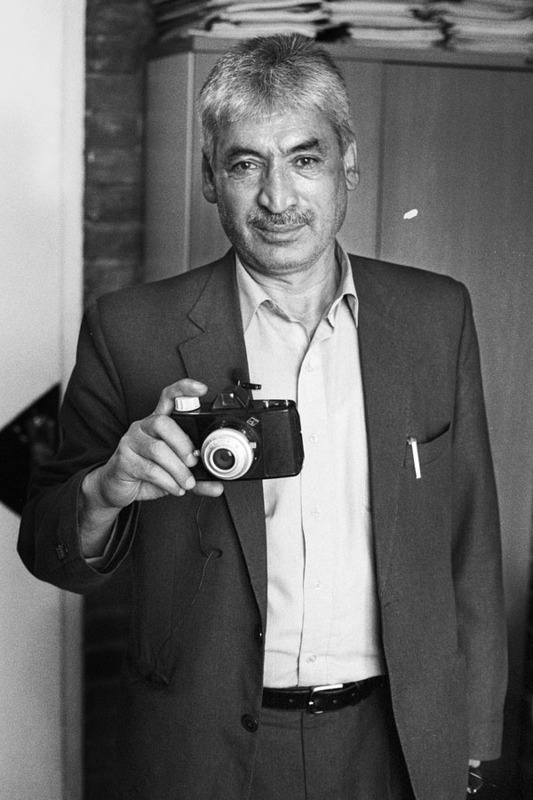 Below is a picture of Professor Abdul Rashid, who teaches journalism at the Kabul University, holding a 35mm camera he received as a gift in 1965 - when he was just nine years old. 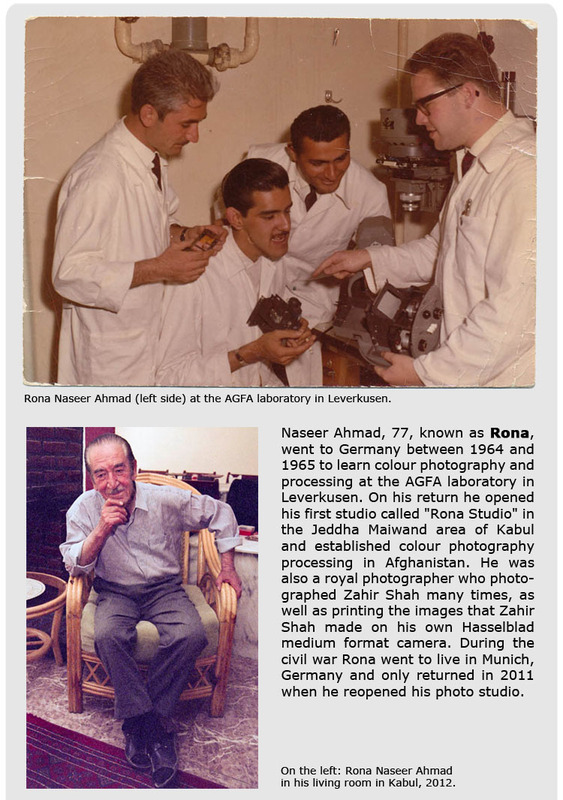 The camera, an Agfa Click, was brought from India, but the film he could develop in Kabul. The 1960s also brought colour photography facilities to Afghanistan. At the other end of the portrait spectrum to box camera images, and where it was available as an alternative to colour processing, were the comparatively expensive and large hand‐coloured portraits. 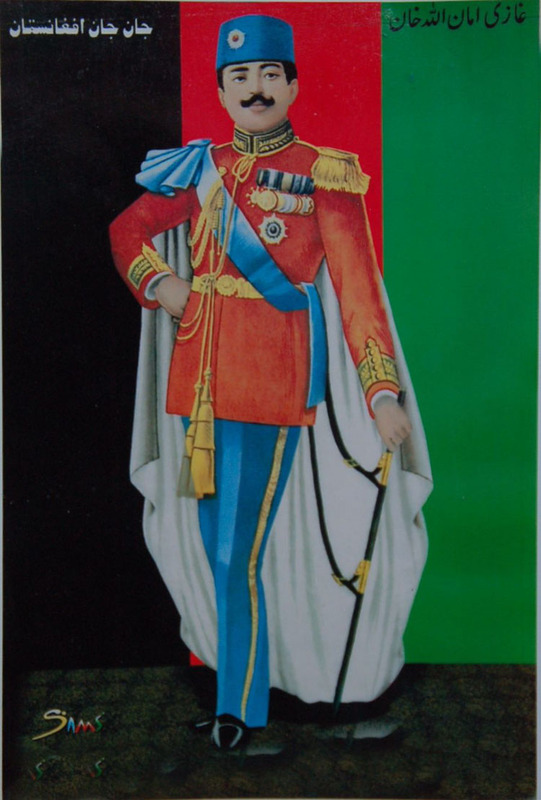 This is a hand‐coloured portrait of General Khotul Mohammadazai from the 1980s. She is one of two female generals in the Afghan army at present. The portrait of General Mohammadazai is very much a reflection of the times it was taken. In 1978 a communist government took control of Afghanistan introducing a series of socialist reforms that attempted to revolutionize gender roles in the country. 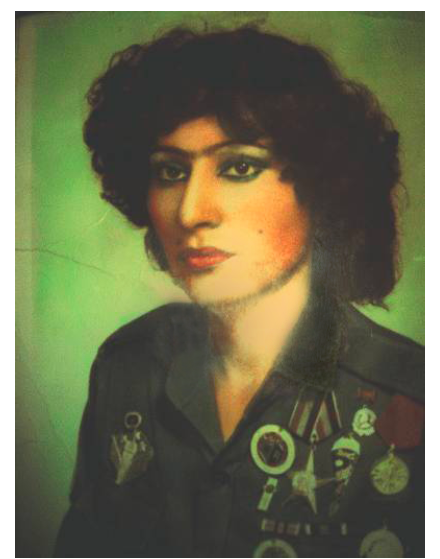 As a result woman began to play a more significant role in Afghan public life and were allowed to join the army as soldiers and rise in its ranks; which the general did initially as a paratrooper. Here’s a clip with the general talking about her time in the army. The communist rise to power was to be a precursor to decades of warfare in Afghanistan. First, the Soviet Union invaded in 1979 to bolster the massively unpopular communist regime and ended up fighting a protracted war against an American‐backed medley of factions; then the country was torn apart, again with outside interference, in a civil war which started in 1989 and which some consider never to have ended. The constant conflict has laid waste to Afghanistan in human and material terms; it has also caused cultural entropy. Photographs and photographic equipment were often destroyed or misplaced or simply left behind in the upheaval and destruction of wartime. In many cases irreplaceable photographic memorabilia was lost – and this before the Taliban arrived to take power in Kabul in 1996, and banned photography. The Taliban leadership considered representations of human and animals as unIslamic; and the Ministry of Vice and Virtue, the Taliban’s moral watchdog enforced an edict banning photography. In short, the hanging of portraits and the general display of images of living creatures, whether it be on a bottle of shampoo or a treasured piece of family memorabilia became a crime punishable by beatings and imprisonment. But as colour‐portraits of Taliban from the time reveal, as with those below by A. Samdi in Kabul, it wasn't necessarily a view shared by all recruits. The ban did, however, force some individuals to destroy or hide their photographic collections. And the livelihoods of photographers were threatened by the edict, which at first encompassed a blanket ban on all types of photography. The Taliban also banned television and most other forms of entertainment. Here’s a news report on life under the Taliban from March 2001. First, the reporter visits a TV repair man who has to work in secret. Eventually, the Taliban relented from a total ban on photography, permitting identity photographs; and box camera street photographers were able to work without being harassed once they stuck to making them. But full-body shots, portraits for non-identity purposes, and particularly images of woman were more usually outlawed. The strictness of this policy does seem to have varied. Some photographers in Kabul claim they were practising portrait photography (for purposes other than identity cards) openly and without harassment towards the end of the Taliban time, while most photographers in Herat report that the Taliban restrictions (bar taking identity photos) remained in place until the Taliban were ousted from power. 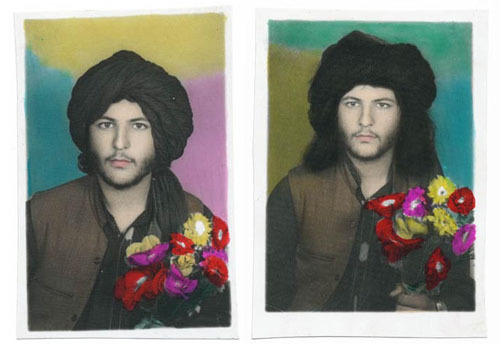 Some photographers turned to a trade in 'clandestine' photographs during the Taliban‐era. This meant taking full-body or coloured portraits of clients secretly with a film camera and smuggling the film across the border to photo studios in Peshawar in the north‐west of Pakistan for development. After the film was developed in Pakistan the illegal prints were returned to Kabul and handed over to the customer. This activity risked imprisonment for all involved on the Afghan side of the border. Such smuggling also occurred between Kandahar in southern Afghanistan and Quetta in Pakistan. 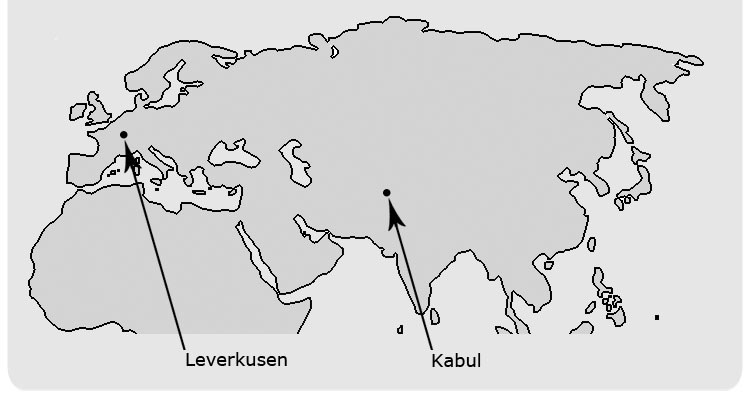 Here's a map of the Taliban‐era film smuggling route between Kabul and Peshawar; the route travels through the tribal areas of north‐western Pakistan and over the Khyber Pass. Nowadays, parks are a good place to find photographers. Below is a clip with a photographer plying his trade around the famous Shrine of Hazrat Ali – also known as the ‘Blue Mosque’ ‐ in Mazar‐e‐Sharif. In the park surrounding the shrine, hundreds of white pigeons flock to a feeding‐spot; and it’s a good place for photographers to pick up business from visitors to the shrine and park. The camera being used is a Fuji instant analogue camera, and is similar to old Polaroid cameras. You can also find photographers using the same type of instant camera in the Shrine of Ali (Kart-e-Sakti) in Kabul where Abdul Qadir (below) works taking photographs of visitors. Before returning to Kabul, Abdul, 48, lived in Peshawar, Pakistan for thirty years, where he learnt how to use the kamra-e-faoree before becoming a staff photographer for a Mujahedin newspaper in the city. In Herat we encountered a mobile photographer walking the streets with a digital camera, a plastic flower stand and a receipt book. He worked for the Rangarang (Multicoloured) Studio who printed out the photographs he took, which he then deliverd by hand to customers. Mobile photographers also ride bicycles. Ahmad Shah Faqiri (below) returned to Kabul ten years ago from Karachi. 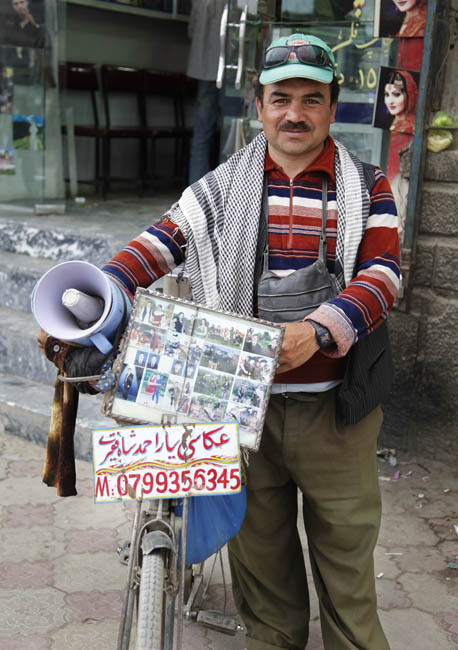 He now travels around the city on his bicycle taking photographs of clients in recreational spots like Babur Gardens. An additional service he offers is to download mobile phone images of customers, via a bluetooth device, which he prints the same day. 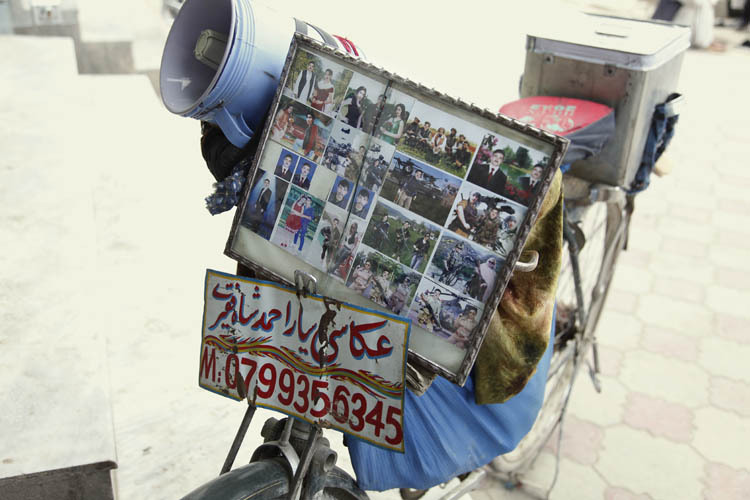 In Shar‐e‐Nau park in Kabul, photographers offer the usual mobile photographer services and more, by manipulating the image to insert the customer's head on top of a novel military montage. ...............................Courtesy of Aurélien de Saint André ©. 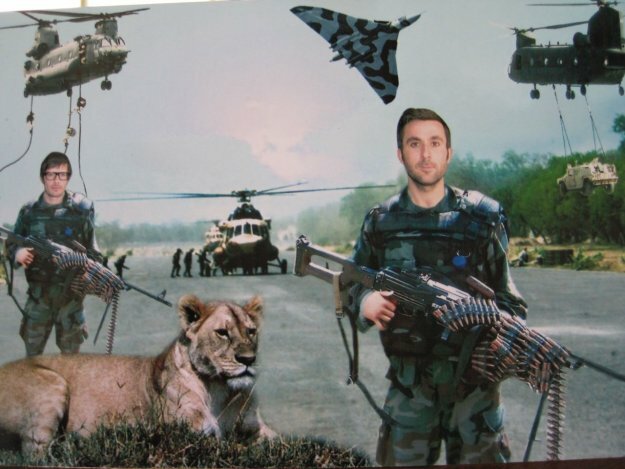 Montages and composite photos are widely available in photo‐studios in Kabul but the vast majority of them are individual and family portraits not militaristic montages like the one above; but they are all commonly manipulated using the computer software Photoshop. Here is a photoshopped image by Asad Ullah. The original image of the portrait above was a hand-coloured black and white photograph. It was imported into Photoshop and digitally cut out from its original background. The sunglasses and the map were then digitally placed on top of the image. In addition, the background was coloured blue and the contours of the face and clothes as well as the colours were enhanced. 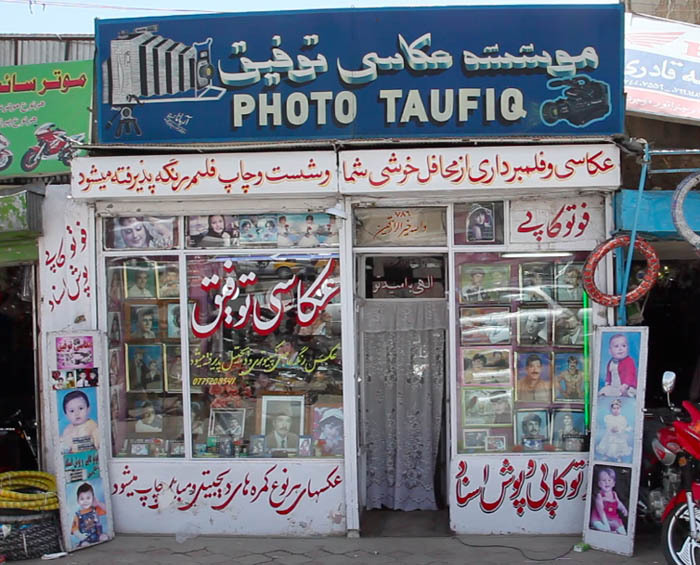 The photo‐studios we visited in Kabul and Mazar‐e‐Sharif were mostly family owned and run; we saw photographs of the family and friends of the proprietors over and over again on the walls of their shops, in the frontal displays, and inside the vitrines by the shop‐counters. The personal character of photo‐studios contrasts severely with what been arguably the loudest say of the Afghanistan photographically on the international stage: war photography. In some ways Afghans are attempting to take more control of this platform and a number of photojournalist and photography courses now exist in the country. One organistaion teaching photography to young students is the Herati Photographers Association presently run by Zaher Maher Herawi. They also teach videography. The Photographers Association in Herat, banned during Taliban times, was restarted in 2003. This is a scene from the play they staged at the party to celebrate the association's revival. A new phenomenon in Afghan photography is the female-run photographic studio intended primarily for a female clientele. A number of female photographers work in the media industry in Afghanistan and a number are hired by male-owned photo studios to take photographs at the women's celebration at weddings (Afghan wedding parties are usually divided by gender) but photo-studios owned by woman are a rarity. 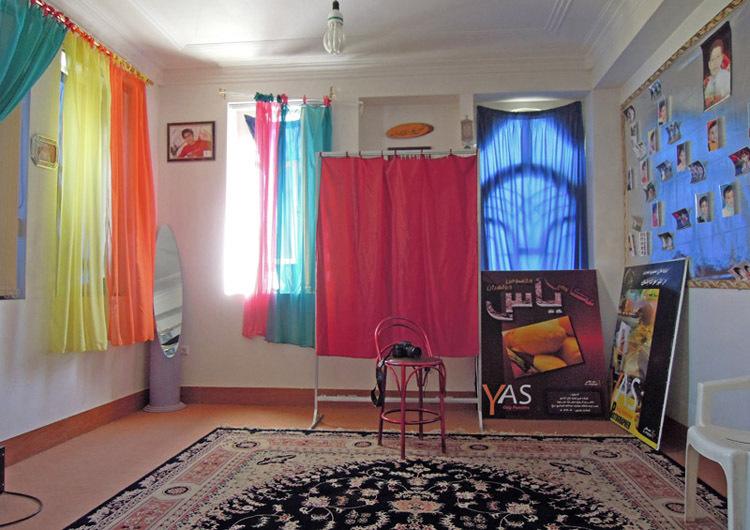 One female owned photo-studio, pictured below, is Yas Photography in Herat ('Yas' means jasmin flower). This is the entrance to the studio. The owner of Yas Photography, Parwana (her name means 'Butterfly'), trained in a private centre teaching digital photography to woman in Qashim, Iran ten years ago where she was living with her husband and children. In addition to taking identity portraits of woman, which is her biggest source of income, Parwana also takes childrens portraits and edits wedding photographs and videos. 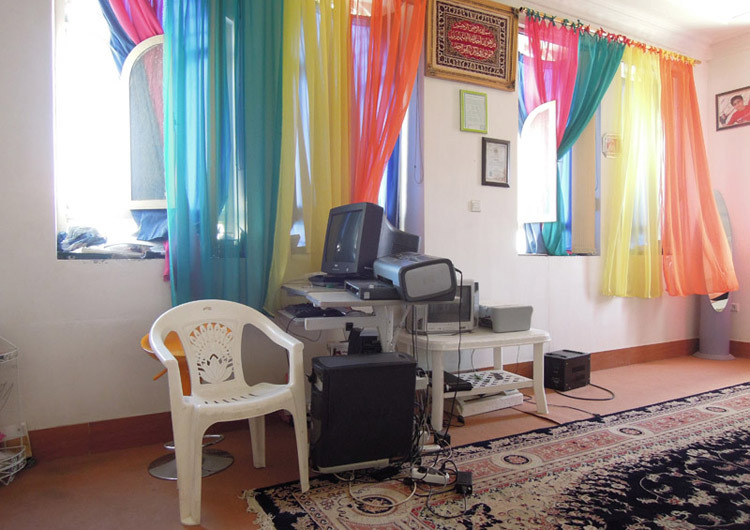 These images below are from the inside of her colourful studio. 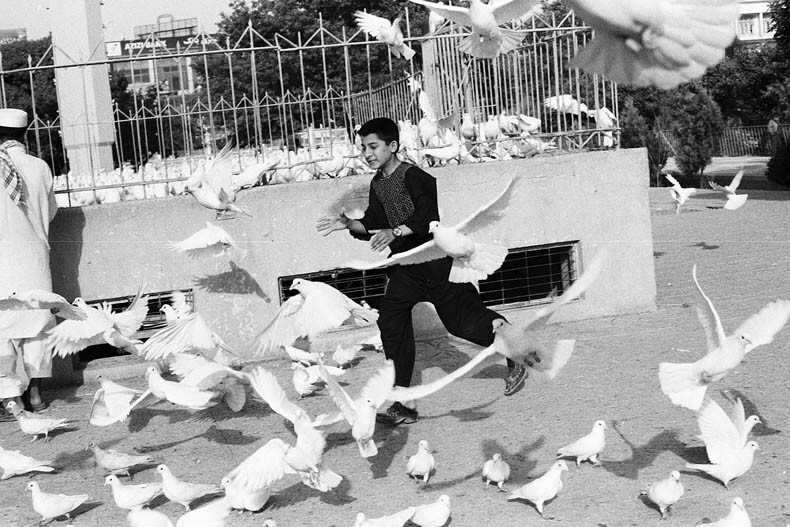 Clearly, photography has ridden a turbulent path since it arrived in Afghanistan. Finding out more about that past (and present) is where different histories and stories entwine and where the spoken word seems more important than the written. 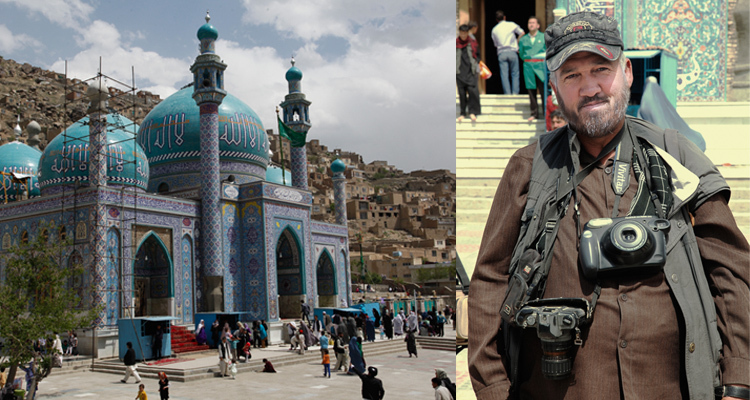 In Mazar‐e‐Sharif we were told that photography in the Afghanistan was older than when the Blue Mosque was blue. And photographs exist to prove it. In Mazar‐e‐Sharif we were also told that if a black pigeon lands amongst the hundreds of white ones feeding outside the famous Blue Mosque, it will turn white in a matter of weeks. So here, in conclusion, is a metaphorical black pigeon landing amongst the many white ones of the Shrine of Hazrat Ali. Or as some might say: it's just history taking its course. Source material for this essay included: Omar Khan’s From Kashmir to Kabul and his article War Photography in Nineteenth Century India and Afghanistan, Simon Norfolk’s Burke + Norfolk, Nancy Dupree’s summary of the KES catalogue, Louis Dupree’s Afghanistan , May Schinasi’s Afghanistan at the beginning of the 20th Century and La photographie en Afghanistan - Réflexions autour d'une collection, Pashto Mashto’s ANN blog, Afghanistan Cultural Profile, Ahmad Rashid’s Taliban, Julie Billaud’s Women’s Public Visiblity in Post‐War/Reconstruction Afghanistan, Siddarth Varadarajan "Have fun in Afghanistan? Enjoy the weather..."